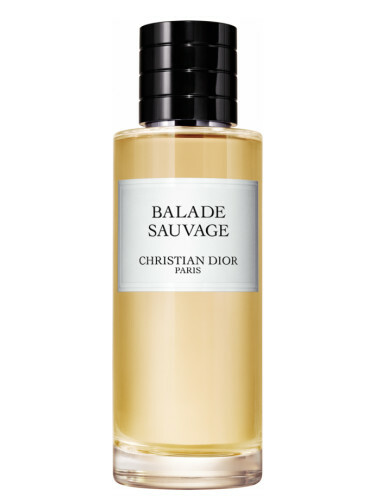 Balade Sauvage: Christian Dior: A Great Summer Choice! Thread: Balade Sauvage: Christian Dior: A Great Summer Choice! I haven't seen much about this new release from Dior and a quick search didn't really yield anything specific other than the initial post that came out when it was announced Dior was releasing 8 new fragrances to the Prive line, so I figured it warranted its own post or another more recent one at least. Why? Because it's very good! This is really a great summer fragrance, and I wanted to post about it now while we're in season in case some of you are looking for a new summer scent and this one managed to slip by you (it slipped by me until last week). It's different than your typical freshie, as it generally has a tropical feeling. It's based around fig, but also blends other tropical smelling fruits and floral notes so it avoids becoming a purely fig-based scent like Philosykos or Figuier Eden, Premier Figuier, etc. I like those scents a lot, but who needs another? So Balade Sauvage isn't redundant in that sense. It's a fruity, somewhat juicy fig-based scent with tropical notes and a really nice warmth that accompanies the scent. It gives off the impression of warm sun. There's also a breezy aquatic edge to it, not necessarily a marine smell of any kind (like seaweed or anything) but more of an atmosphere. There's also something very smooth about it, and you can really feel it in the base--it doesn't just skid out in a base of white musk or dry woods. Apparently it has labdanum, so it could be that which gives it a very smooth and round, almost-suede like finish. And on the whole the scent itself is very smooth and natural, no scratchy synthetics or chemicals to speak of and while it has some citrus notes in it, they're soft, so it never feels sharp or like you're wearing a typical citrus fragrance. Projection is good, above average, and longevity is about 8 hours with 4 hours of good projection. Anyway, this is just a really nice release, and of my favorite in a long time. I like Amouage Beach Hut man a lot too, so between this one and Beach Hut, I kind of feel set for the summer (they're totally different too). I don't know if I'd recommend blind buying it due to the price, but it's definitely worth checking out. Has anyone else had a chance to wear this or at least sample it? What are your thoughts? Re: Balade Sauvage: Christian Dior: A Great Summer Choice! First time actually hearing of it BB. From your description, it sounds like another winner from Dior. Sounds lovely, will add this to my list of things to track down - cheers! Definitely like the sound of this one B, methinks it'll make a good candidate for the splits plus your review makes it seem quite appealing too, thanks. It’s funny you say that because as someone who rarely participates in or thinks about splits, one of my first thoughts with this one was, “This would be an awesome scent to get in on through a split.” Not because it’s not FBW, it definitely is, but because it’s something you could get 25mls or 50mls of and really run wild with it during the summer. As is, I believe it’s only sold in 4.2oz. sizes. I've worn it and didn't really like it, although it did have a nice base that was almost (and surprisingly) like oak moss. The top wasn't quite scratchy synthetics, but it felt grainy to me. Dior says it's supposed to be like volcanic stone warmed by the sun, and I can get something like that from it, but it feels gimmicky to me, and not something I really enjoyed. It smelled more synthetic / less natural than most of the fragrances in the line. It's a neutral for me. I have to pay attention and see if I pick up on that next time. I saw in the note pyramid some allusion to stones, but I didn't get that when I wore it (but I wasn't looking for it since I hadn't seen the note pyramid yet). It comes off very smooth and natural to me, but I've never been too sensitive to synthetics either. Thanks for your input though, it's always good to hear the potential pitfalls of a scent as well as another perspective. Own a bottle and love it. I feel ya bud, a vast majority of scents fall under that category for me. You can pick it up in 125ml, 250ml and 450ml sizes in the UK. Thanks for sharing your thoughts bud, always nice to hear another perspective on a new release. Yeah, I'd be up for a split of that too - even 125mls of a Dior Privee is about 4 lifetimes worth unless you want to be a walking scent cloud...! A very nice mix of fig and citrus that I find refreshingly fruity and natural - light but not weak. I guess the two adjectives that keep popping up in my mind are robust and zesty. Can comfortably be worn by both genders IMO. it's sweet and relatively feminine leaning for me. the smell is very reminiscent of robinsons peach fruit & barley squash, smells a lot more peachy than fig. pleasant enough but just too sweet. Can anyone compare this to Ninfeo Mio (Annick Goutal)? I vaguely remember smelling it but then preferring the AG. Dammit Buysblind. I'm trying to control my spending but your description of a fig-tropical-floral scent has me itching to try it. Thanks for endangering my wallet man. While I don’t find it too sweet, I definitely pick up on something that smells like peach or apricot in the mix. It could be osmanthus too, but either way tigers definitely some of that present. I find the fig stronger however, and the peach/apricot more subtle. Fruity fragrances are great for summer, will look into it when the new range lands in Australia. Santal Noir and Purple Oud have my attention as well. Thanks. I'll be sure to revisit it. I can't believe I'm not drawn to a single one of the new fragrances in the Privee collection, so I'll second guess myself and brave them again. Don’t worry, I’ve reserved a spot for you in the “Today I Bought” thread. I'd definitely be interested in a split for this. I don't have too many options when it comes to the Dior (or Chanel) private line. Haha, IKR?! At least you can sample it locally. I'd definitely be interested in a split for this. Yet another fragrance from the house of Christian Dior with the word "sauvage" in the title! Just sampled. Reminds me of Dunhill Icon with that grape soda vibe. A winner in my book. I found balade sauvage to be similar to Hermes un Jardin en Mediterranee. the scent of both was so similar that preference is a matter of logistics. The Dior BS didn't have the best performance with me, while Hermes was better. Hermes gray market is almost 1/4 the price of the Dior Privee.